A similar development took place in Lithuania. Its Governor General, Mikhail Muravyov (in office 1863–1865), prohibited the public use of spoken Polish and Lithuanian and closed Polish and Lithuanian schools; teachers from other parts of Russia who did not speak these languages were moved in to teach pupils. Muravyov also banned the use of Latin and Gothic scripts in publishing. He was reported as saying, "What the Russian bayonet didn't accomplish, the Russian school will." ("Что не додѣлалъ русскій штыкъ – додѣлаетъ русская школа.") This ban, lifted only in 1904, was disregarded by the Knygnešiai, the Lithuanian book smugglers, who brought Lithuanian publications printed in the Latin alphabet, the historic orthography of the Lithuanian language, from Lithuania Minor (part of East Prussia) and from the United States into the Lithuanian-speaking areas of Imperial Russia. The knygnešiai came to symbolise the resistance of Lithuanians against Russification. After the uprising,[which?] many manors and great chunks of land were confiscated from nobles of Polish and Lithuanian descent who were accused of helping the uprising; these properties were later given or sold to Russian nobles. Villages where supporters of the uprising lived were repopulated by ethnic Russians. Vilnius University, where the language of instruction had been Polish rather than Russian, closed in 1832. Lithuanians and Poles were banned from holding any public jobs (including professional positions, such as teachers and doctors) in Lithuania; this forced educated Lithuanians to move to other parts of the Russian Empire. 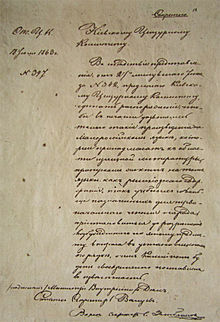 The old legal code was dismantled and a new one based on the Russian code and written in the Russian language was enacted; Russian became the only administrative and juridical language in the area. Most of these actions ended at the beginning of the Russo-Japanese War of 1904–1905, but others took longer to be reversed; Vilnius University re-opened only after Russia had lost control of the city in 1919. The Russification of Finland (1899–1905, 1908–1917), sortokaudet ("times of oppression" in Finnish) was a governmental policy of the Russian Empire aimed at the termination of Finland's autonomy. Protests and petitions against the bill by either civic society, groups of public intellectuals or regional governments came from Tatarstan (with attempts for demonstrations suppressed), Chuvashia, Mari El, North Ossetia, Kabardino-Balkaria, the Karachays, the Kumyks, the Avars, Chechnya, and Ingushetia. Although the "hand-picked" Duma representatives from the Caucasus did not oppose the bill, it prompted a large outcry in the North Caucasus with representatives from the region being accused of cowardice. The law was also seen as possibly destabilizing, threatening ethnic relations and revitalizing the various North Caucasian nationalist movements. The International Circassian Organization called for the law to be rescinded before it came into effect. Twelve of Russia's ethnic autonomies, including five in the Caucasus called for the legislation to be blocked. ^ Szabaciuk, Andrzej (2013). "Rosyjski Ulster". Kwestia chełmska w polityce imperialnej Rosji w latach 1863–1915 (in Polish). KUL. p. 209. ISBN 978-83-7702-819-3. ^ "Short History of the Cyrillic Alphabet – Ivan G. Iliev – IJORS International Journal of Russian Studies". www.ijors.net.